Did you see clouds that looked like they had a hole punched out of them? 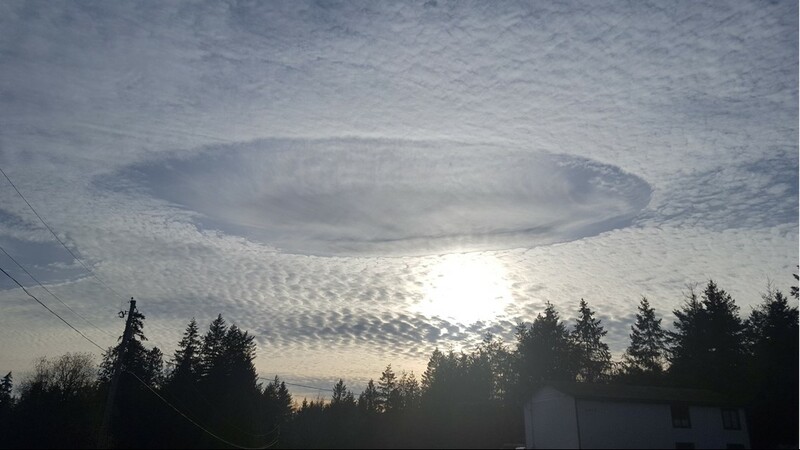 Hole punch clouds were once again spotted around Western Washington today. The circular-shaped cloud patterns are also called fallstreak holes. They are caused when supercooled water droplets in the atmosphere are disturbed, according to KING 5’s Jordan Wilkerson. The disturbance, which could be caused by aircraft, causes the droplets to turn into ice crystals and fall. Similar to a super cold water bottle that freezes when hit against a surface, the abrupt movement causes the droplets to lock up. It also creates a chain reaction with nearby droplets, creating the effect of a hole punched through in the clouds.